Online art sales are in their infancy (only 8.4% of the overall art market), and early adopters often face challenges and frustration. Telling your artist story is an effective method of making that important connection to your audience. When a website is the means you have to communicate about your art, you must be sure to share enough information about yourself, your inspiration and your technique to make a connection with the viewer. ProductViz provides quality portfolio-caliber pictures of artwork. We show artists work in an interior setting. The concept is to provide a free educational platform that teaches, supports and provides feedback for visual artists everywhere. The more highly ranked the other site, the more “link juice” it provides. Google’s search engine likes to see backlinks that come from authoritative websites, which helps to distinguish yours as worthy of a visit. So, as an artist or maker who wants to jump into online sales, what are your choices? 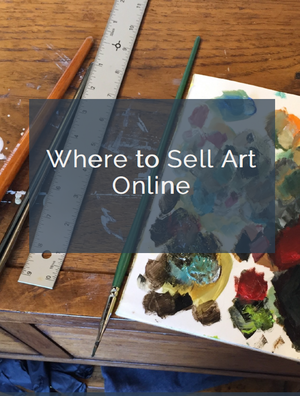 Basically, you can choose to participate on a third-party website which offers art for sale, or you can use your own art website to sell your work. I see a natural progression happening for artists. They look for a place to sell and start out on one of the big marketplaces. They learn the basics, gain confidence, and branch out on their own. iVANZi created a business model where they act as a go-between for the artist and the retailer, in some very interesting ways. Information can be visual, through the use of in situ photos, where seeing the size and impact of your art helps the shopper imagine owning your work. Can a video that shows your studio practice in an emotionally compelling way communicate what you do effectively and build the value of your work too?